The most stressful time of senior year falls right when Fall begins (pun intended). Trying to raise your C to an A in that one class so you don't destroy your GPA and writing seven essays about yourself just so one college can accept you are just a few things that make my favorite season a terrible time. A lot of my older, college-bound or even out of college readers don't want to look back at that tragic history, but I know many of my audience is in the same boat as I am. People who say that senior year is the easiest are definitely incorrect in their assumptions, and I would like to prove them wrong by showing them my impossible schedule filled with college apps and studying and even managing two jobs. I don't want to use this blog as an outlet to complain about my miserable life, but you should understand by now that I'm not having the best senior year. Even for the people who are younger or older than high school seniors, two months into a new year can be difficult for everyone. I only bring up my stress to prove a positive point -- that there's always something good to replace the negative. In this wonderful season, I get to use the abundant choices I have for autumn fashion to almost "get me through" such a stressful period. Yeah, I'm that fashion dweeb who gets excited when I get to put new looks and ideas into outfits for the new season. It makes me think of all the opportunities I have for Fall fashion, and even if I have a C in AP Lit, at least I'll look good while having it. One of my favorite things to do in fashion is to "solve" a fashion dilemma by creating something beautiful out of it. Of course one of the common app essay prompts says something along those lines, and because I currently live and breathe college apps, I would use it to help me with fashion. With fall, these problems are easier to solve because you can layer more items on top of each other, while in the summer, that can be really tricky. The issue I had a few days ago was that I wanted to wear a dress, but it was slightly too short in the back to wear on its own. I could have worn the dress with leggings, but I wasn't going for that kind of style. I also had another issue on top of the first one. 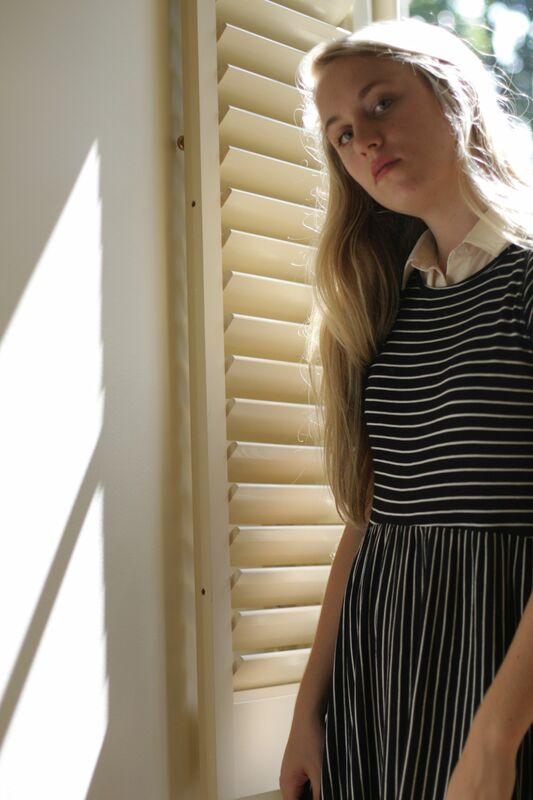 I wanted to wear a sheer, collared dress (that is no longer a dress on its own because it's too short on the sides), which I wore here last spring, but I didn't want to wear it in the same way as that last post. I simply combined the two problems, and a solution came out of it. Although the collared dress is too short, the back is longer, and the back of the other dress is too short, so the combination of the two made the outfit an appropriate length. Not only did this solve a measurement issue, but it also created a unique outfit consisting of flowing layers, additional collars, and a classic black-and-white color scheme. Hence, the "something beautiful" was created. I solved the issue, but I also wanted to create something more with the outfit, so I layered my denim jacket over it to give it a casual feel and to also create the double-collar look (and you thought one collar was enough). And maybe you're still asking: why did I bring up that first story in the beginning of this post? Maybe it wasn't necessary, but I do like connecting my posts to my personal life, and creating this outfit actually did make me feel better about this stressful time (I don't care how strange that sounds, I know I'm not the only one). Fall shouldn't be a stress-filled season, at least in my perfect world, so I'm making it better by playing around with fashion ideas. With all bad comes the good, and even with something as minor as this, every little thing counts. Both dresses by Urban Outfitters. Jacket by Juicy Couture. Shoes by Steve Madden. Photos taken by me (which will, from now on, be done on my Canon EOS 40D). Finally, after four long months of summer (including the warm months of late spring), the dreaded season is coming to a close. There's no valid reason as to why I hate this season, except for the fact that the hot weather makes me uncomfortable and fashion choices can be slightly tricky. I've still made the best of this season by making warm weather fashion choices impossibly cool, but knowing that it's almost over only brings a smile to my sweaty face. I'm excited for this upcoming season because it's the first fall where I get to show off my autumn style on this blog -- I only started getting serious with the blog this past winter. Only five more days until I can wear autumn color schemes, boyfriend jeans/overalls, and the most envied fabric of the season, aka suede. However, it gets difficult when fall weather is a few weeks behind the actual change of the season. This is especially relevant in the South, so the final question is this: how can we dress for fall and still be comfortable in this awkward climate transition? I've noticed from the weather in the past week that it can be as low as 50 degrees in the morning and as high as 85 in the afternoon. If it were a perfect world, we would just have two outfits for the day. But for most of us, this isn't possible with our unglamorous and busy schedules. To fix the problem, we have to find a happy medium. And I found this solution a few days ago when the weather was especially complicated. 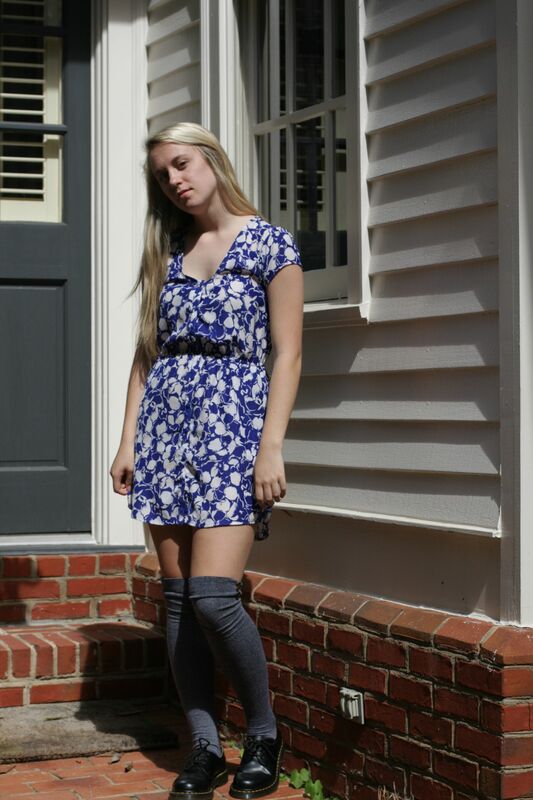 Dress and socks by Urban Outfitters. Shoes by Doc Martens. Playing with seasonal transitions can be really fun and experimental at times because instead of just mixing styles for the weather, we can mix styles based on seasonal trends. With fashion today, you can do absolutely anything you want, and with good reasoning, it can be deemed stylish by even the most important people in the fashion world. For example, wearing a fun, floral summer dress with grey thigh-highs and black Doc Marten oxfords completely works because it combines summer and fall trends for an outfit perfect for seasonal transitioning. Instead of just wearing thigh-highs to work with a cool and warm day, pair them with an item that screams summer on its own, but says autumn with the combination of the fall accessory. This brings contrast to outfits, and it also gives a uniqueness to a traditional fall look. The floral and bright blue pattern of the dress brings summer style, the neutral and dark color scheme of the socks and shoes brings winter style, so the combination of the two gives a happy medium -- fall style. It's a dimensional outfit -- it solves the awkward weather dilemma, but if you dig deeper, it also works with the seasonal styles. Maybe it's not everything we see on the runways these days, but putting thought into how to make a fall outfit by combining items from different seasons proves that you didn't just copy what you saw in Vogue or the Calvin Klein fashion show. Fashion isn't just buying the most expensive things you see on the runway. It requires an innovative, creative mindset that can thrive in a world that is filled with these types of people. It's Spring/Summer fashion week season, a.k.a. my 2nd favorite time of the year (the Autumn/Winter one will always be my favorite, I have a thing for cold weather fashion). With the start of New York Fashion Week, fashion shows, the latest trends, and the best street styles are all any fashion lover is talking about. Even living 800+ miles away from the event, I still try to use this time as my own "mini" fashion week. No, I don't put on my own fashion shows (if only that were possible...), but I do use what I've learned from these past fashion weeks into my own style. The AW 2015 fashion weeks brought some of my favorite trends to the runway, and now that it's almost Fall of 2015, it's time to showcase what we've learned from those fabulous fashion shows. The start of the SS16 fashion weeks is around the time where the clothing from the AW15 fashion weeks actually comes out in stores, so now is the perfect time to dress "fashion week ready". I would love to head over to Topshop and buy the AW15 collection (which was definitely my favorite of the season), but my lack of money prevents that from happening anytime soon. The time for that will come (hopefully before this fall and winter end), but to still showcase fall trends without spending, I combined a few items I've bought in the past to make the perfect look. Since it's still officially summer, choosing a perfect fall/winter outfit is pretty tough in this weather. 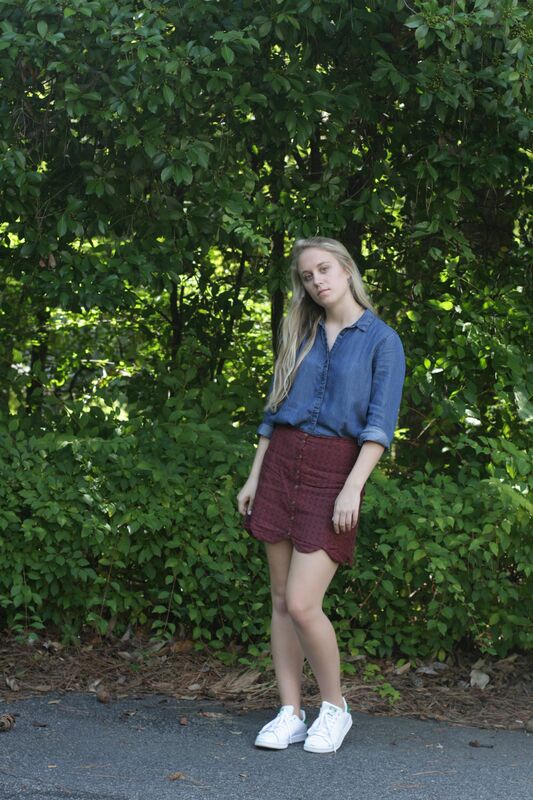 However, making fall-esque outfits perfect for warm weather is not too difficult. I took the trend of bold prints and mini skirts (which were usually done in thick fabrics, like suede) and made it compatible for summer by choosing a light skirt from Urban Outfitters. 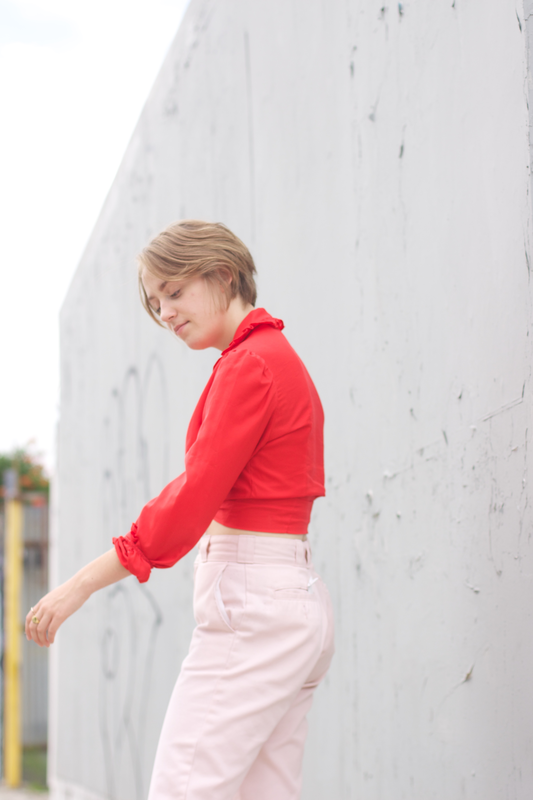 Button-up skirts have been on the fashion-must-haves list for months now (I already own three, and I still want more), so the skirt in the photo above is perfect to become fashion week ready. 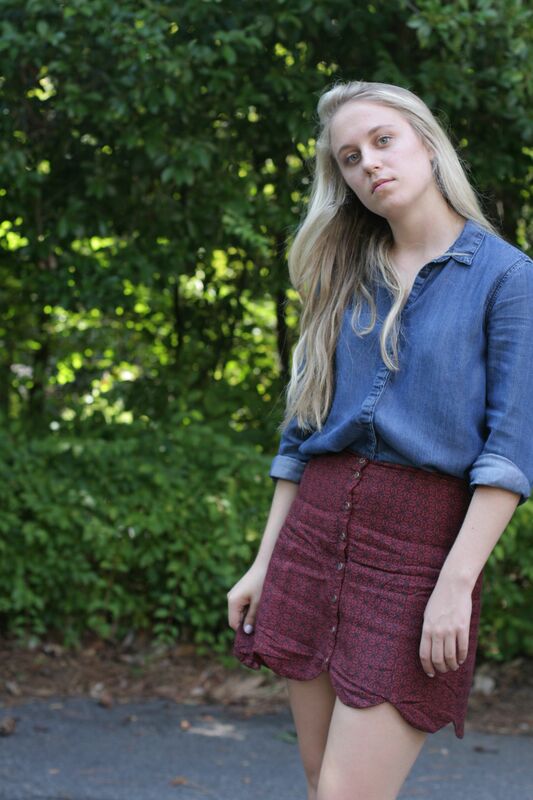 Denim by itself was not a specific trend we all saw in the runway shows during last season's fashion weeks, but the combination of the shirt and skirt pertain to one I noticed a lot -- the return of the '70s. I've been all for this trend ever since my review of the Topshop AW15 show, and it still lasts with the revival of suede and other styles from the past. The '70s bring a certain nostalgic feeling that make us want to bring our denim flares out once more. Because I'm not technically on board with that return, I went for the trend in a more subtle manner by pairing a denim shirt with a bold mini. Even the faded blue and rustic red color scheme works with this revival. Wearing AW15 trends just gets me more excited about the upcoming SS16 trends. I only wish I were in New York right now, being surrounded by fashion, but the time for that will come, hopefully in a year. Shirt by Gap. Skirt by Urban Outfitters. Shoes by Adidas. Side note: Because I'm extremely busy this semester (AP classes, college apps, two jobs, and dance), I'll only be able to post about once a week (probably in the beginning, like Mondays, so I can use the weekend to prepare for the posts). Once this semester is over, I'll be able to post how I normally post (2-4 times a week). I'm literally that person who will not shut up about her favorite band, but that favorite band is denim for me. 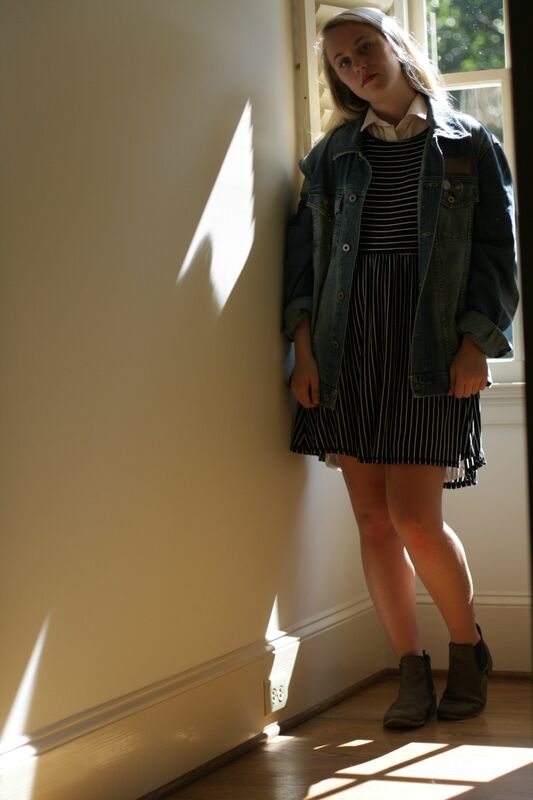 Denim has gotten me through many fashion mishaps and dull outfits, and its unique nature has been able to add a lot of variety to my wardrobe. However, I look at how I've worn denim in the past, and it's been pretty similar. I usually stick to a light wash, and this includes everything from jeans to jackets and even to skirts and dresses. Then, I start to realize that the most diverse (at least for me) ways to wear denim is one of the simplest tricks in the book -- step outside the "blue" denim zone. I've stuck to this traditional type of denim my entire life (except for that one time in 6th grade I bought purple skinny jeans...), and there's far more than this color. Opting for something besides blue denim doesn't have to mean wearing the brightest pair of jeans you can find. It just means wearing the fabric in any other color besides blue. This ranges from black to white and everything else in between. The color black in denim is something that I've always been hesitant to try. My wardrobe is full of black, but I've never once had this color in a denim form. I love denim, I love black, but I've never loved the combination of the two. In the past, the combination of black and denim had a connotation of only being worn by the "scene kids" -- not that I have anything against people who listen to MCR, but this weird and unconscious bias of mine was made when I was in my judgmental phase in middle school. Because of this, I strayed away from black jeans, maybe because my older sister always wore them when she was in high school (being influenced by your sibling's fashion choices could mean that you did the opposite of them...). Jeans by American Eagle. Top by Anthropologie. Shoes by Adidas. Now, as I got less judgmental with fashion choices and saw more and more people rocking the black skinnies again, I saw that the jeans were a fashionable alternative to the traditional blue denim we usually see in jeans. Even with all of this, I was still hesitant to try them out. Black denim is edgier than most of my style, and I'm also not a huge fan of jeans (especially in the summer). But as summer starts to fade away and my fashion-mind is more open than ever, I decided to try them. This is also pretty different to my normal style because the jeans were skinny (like cling to your legs skinny), and I usually wear a looser fit, like boyfriend jeans, because of my hatred towards the way most jeans fit me. But, because I was already trying new things, I decided that the skinny nature wouldn't stop me. They happened to be more comfortable than most skinny jeans that I've worn in the past, and the few holes that they had fit into my own style more. Because I was going for a simpler look, I paired the jeans with my blue-striped tank from Anthropologie and my Adidas sneakers, which happened to look amazing with the skinnies (I don't think any of my other shoes would have worked with this outfit). These were definitely an edgier style for me, but I love trying new things in fashion because that's the only way my style can evolve. Black denim is perfect for this transition of seasons, even if it's still 85 degrees every day where I live. I'm excited to continue wearing black denim into the colder months because those seasons are the best times to experiment with fashion (Layering over black denim? That sounds like a fashionista's dream).